as September gets under way, i'm really in the mood for blues and interesting textures. one of my favorite recent purchases is this madewell chambray shirt – it's got the perfect lightly faded wash and the fabric has that old school vintage chambray feel. not too thin and not too denim-y. kind of addicted to pairing it right now with a chunky costume necklace. the textures of the necklace + the slouchy drape of the chambray + the marant boots, topped off with the SC bag encapsulates all my favorite elements of easy fall dressing. what colors and textures are you feeling for fall? For winter I'm really looking to invest in leather pants... but for now I just got my first pair of wax jeans that looks sort of like leather but of course are not. Leather with soft knits or a flannel shirt. That combination excites me the most for fall/winter! Could this be the one? The perfect chambray shirt is hard to come by - not too thin, not too thick, not too long, some drape but not too "boyfriend." Do you think it runs true to size? I am a 4 in most clothes and would either get a small or extra small. I know what you mean about this shirt making you feel like yourself. I had this shirt in high school, complete with sisal bucket bag. I have looked at this one, and the selvedge denim from J. Crew. The Madewell looks great on you! What a great outfit. That shirt does look great on you. Because its a lighter wash, is it a bit transparent? Would you be able see a darker color bra underneath? I second the desire for more leather this fall. And leather pants/leggings would definitely fit the ticket. i'm also very interested in some non-skin tight options too. Something like a cropped leather trouser silhouette - tappered and trim but relaxed too. Also, craving more cocoon cardigans in prints like houndstooth and even argyle. They feel like cozy blankets and I like mixing "grandpa-chic" with tougher stuff like leather. thanks! it's completely opaque - midweight chambray cotton that's really soft yet holds structure really well too. Exactly what I thought. This is the perfect outfit. I may have to Pin it:). please do :) glad to see you on pinterest! I have recently bought a chambray shirt at Tom Tailor. It has elbow patches which I love, but I do not really have any idea how to wear it. 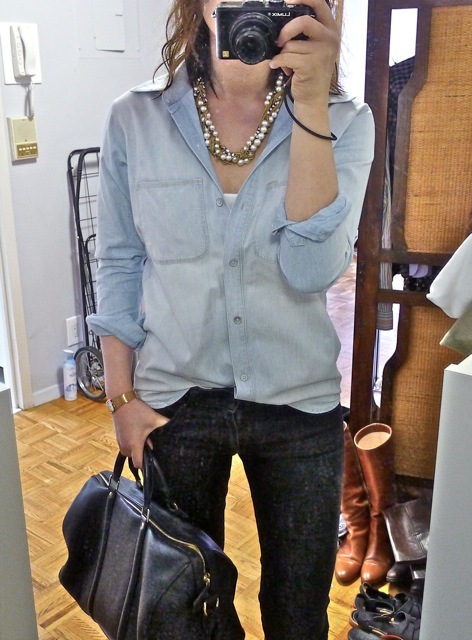 Is it too tacky to wear a chambray shirt in light blue with a few shades darker blue jeans? I don't usually like it when people dress head to toes in the same colour but different shirts. Need some black pants, because the ones I have right now are blue jeans and grey and red jeggings haha. Maybe the grey one would go with it? i think black and grey jeans would be perfect, but you could easily do a darker blue denim to pair with a lighter chambray shirt. play around with the different combos and see which one you feel more 'you' in :) i personally think anyone can pull off anything so long as they feel good in what they're wearing. Love! when did you get the SC bag? have you done a review? it is on my long term list, and I would love to hear your thoughts! Love the shirt, it looks great on you! 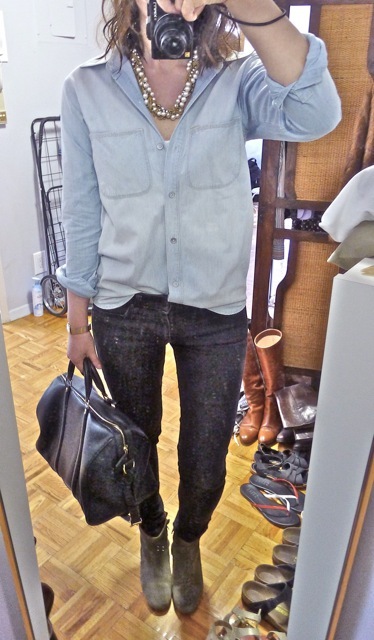 I'm also wearing my IM Etoile chambray shirt a lot now, with dickers and jeans just like you. I'm looking forward to bringing out the knits too. And your bag..sigh. i hope you start posting again to your blog - we miss you!! Love how you glammed up the outfit with the accessories. I like the mix of textures going on. I live in my Madewell chambray shirt. I really love the cut and fit. I stumbled upon your blog one day while looking for ways on how to style my faux leather leggings(although they feel more like pants). I love your defined minimalist style with a hint of biker chic-ness and your blog posts are so easy to identify with. Your style is a fresh air to many of the over the top current bloggers out there. You have a style that I admire so much. I am still trying to get a feel of what my style is currently and your blog puts into perspective that maybe I have been buying too much clothes that do not suit me. I am still experimenting with different styles, and I really am into the leather phase now. Anyway , I like your Essentials guide and find that every item is really essential. I tried on the Chantelle bras you recommended , and sadly , they do not have my size. Apparently, I have a small ribcage and the brand does not offer it in that size. I will have to search for better alternatives. hey there - thanks so much for the really nice comment. :) you made my day! oh! that bag... I'm loving 100% cotton tops and raw denim for fall. I'm having a hard time getting behind my leather jackets again. The material is making me morally uncomfortable after all these years. So lovely to have stumbled upon your blog while searching for sizing info on Dicker boots. Going to enjoy going through your archives! i'm curious about the uniqlo jeans. what do you think of them? i know you are a fan of j brand. how do they compare?